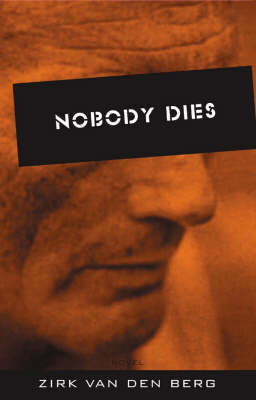 It has just been announced that New Zealand author Zirk van den Berg’s acclaimed crime novel NOBODY DIES, which was rated as one of the year's best thrillers on its original print release in 2004 (see cover image right), will now be published in Afrikaans translation in South Africa in 2013. After falling out of print and becoming hard to find for a few years, this terrific thriller became widely available in English (in ebook form) earlier this year (Smashwords, Amazon, Say Books). Which was great. NOBODY DIES centres on apathetic loner Daniel Enslin, who after witnessing a criminal big-wig commit a murder finds himself taken into witness protection for his own safety; only the cop in charge of witness protection has a tendency to make her charges 'disappear' more permanently off the radar. NOBODY DIES seems to be one of those books that sticks in peoples heads. It caused the New Zealand Listener to ask whether van den Berg was the best thriller writer in the country (after only one book), and in late 2010, Stephen Stratford, the head of judges for the literary-fiction focused NZ Post Book Awards (our Kiwi equivalent of the Booker Prize or Australia's Miles Franklin Award), said in an excellent article by Mark Broatch in the Sunday Star-Times that he was "still waiting for a new novel from Zirk van den Berg whose outstanding Nobody Dies came out in 2004". Several years ago, Namibian-born Kiwi Zirk van den Berg’s debut thriller (in English) was published to high acclaim, before becoming ‘hard to find’. Now, at last, it is widely available as an e-book. A South African cop has found an easy way to make criminals in the witness protection programme impossible to find; she kills them rather than relocating them. When Daniel, a relatively innocent man, is placed in her ‘care’, he must find a way to survive not only the crime boss who is after him, but his ‘protector’. An absorbing, tense tale that brings the expanses of South Africa to life on the page, along with the grey areas in human hearts and minds. Terrific. You can read another, more in-depth, recent review of the ebook version of NOBODY DIES at Mack Lundy's blog, Africa Screams (read Mack's review here). As the announcement about the upcoming Afrikaans translation notes, it is rare for New Zealand books to be published in Afrikaans translation, though it has happened to authors such as Margaret Mahy. The Afrikaans language community is almost twice as large as the New Zealand population. South African publisher Kwela (part of the country’s premier Afrikaans publishing group, Media24) approached Van Den Berg, proposing an Afrikaans translation of the book. Though Nobody Dies was originally written in English after the author had migrated to New Zealand, Van Den Berg’s first language is Afrikaans and he made his debut writing in the language. He is undertaking the translation himself. The Afrikaans title, 'N ANDER MENS, can mean both “another human” and “a different person”, as in someone who has changed. The book is slated for Afrikaans publication in May. Craig - It's always good to hear it when a well-written thriller has a chance at a new audience. Thanks for sharing. I second what Margot said. I'm always thrilled to see an old book with so much in it come back into the spotlight!